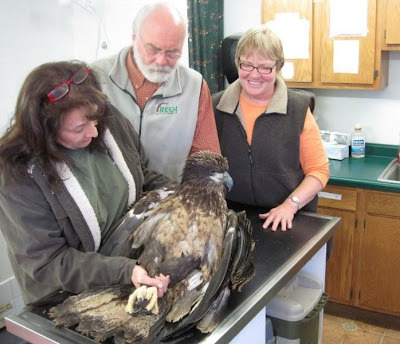 We admitted another immature Turkey Vulture from the Ladysmith area. Turkey Vultures are not frequent breeding birds that far north. I am beginning to wonder if the youngster admitted last week and the one admitted yesterday might be siblings. They were found not too far from each other and both are very young birds. 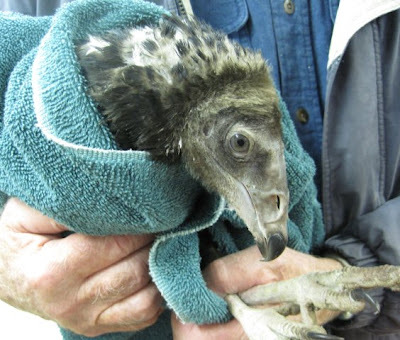 You have to admit there is something very fetching about the sweet face of a Turkey Vulture baby. :) He was so thin when he came in I was worried he might not survive, but 24 hours later he seems to be doing quite well. He was pretty happy to see other young vultures here when he arrived. I am sure he felt like he was totally abandoned when the adults migrated a few weeks ago without him. Tis the season also for young Great-horned Owls to get into trouble and find their way to REGIs doors. This youngster was found where rodent poisonings had been used. People often do not realize that when a raptor eats a rat or mouse that has ingested rat poison, the raptor becomes poisoned as well. We treated this owl with vitamin K in hopes to stop internal bleeding which often occurs with some varieties of rat poison. At this point is hard to know what kind was used. He sure isn't feeling well tonight. many thanks to Wildlife Rehabilitator Laura Kildow from Stevens Point for catching this guy up and driving him to a pick up point so we could care for him quickly. 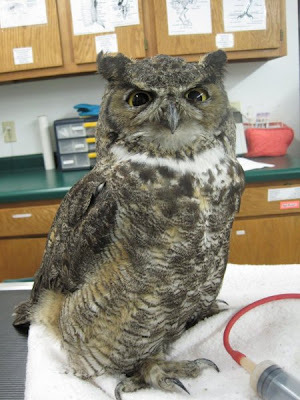 The Great-horned Owl admitted a week ago is doing splendidly. She went into a small enclosure today "out" of critical care. I will try for a photo of her tomorrow. She has the tallest ear tufts around! We will have our last tour of the year on Saturday. Since we had snow the last two mornings in a row I think it is not a moment too soon. More tomorrow.Good night for now.